Orthorexia nervosa is a sickly ironic twist on healthy eating, a laugh in the face of nutrition facts. It’s what used to be called an EDNOS: Eating Disorder Not Specified. The term “orthorexia” was coined circa 1997 by a doctor who suffered from the condition himself: there was no name for this condition, therefore there was no research. And since there was no research, it was just deemed a vague, disordered set of habits. Still, 20 years later, the information about Orthorexia out in the world – and by the world, meaning The Internet, of course – is mostly the same words regurgitated over and over. Speculation. Haziness. The worst part? Orthorexia is still not recognized by some doctors as a “real” eating disorder. Isn’t any form of an eating disorder a “real” eating disorder? Orthorexia and other EDsNOS don’t always result in extreme weight loss. For me, it did. But even in my healing process, my weight fluctuated up and down – it was never a true indication of whether I’d moved forward or not. So how do you know that you or a loved one might be on the orthorexic path – or developing disordered eating habits? Here’s some signs you might need to intervene, and some things that worked for me when I was at my all-time low and decided I’d had enough. May was Mental Health Awareness Month – but just because the month is over doesn’t mean we should stop talking about it. I can’t think of a better guest to remind us of this: someone who is a prime example of taking your pain and trauma and turning it into something that can help and empower others. 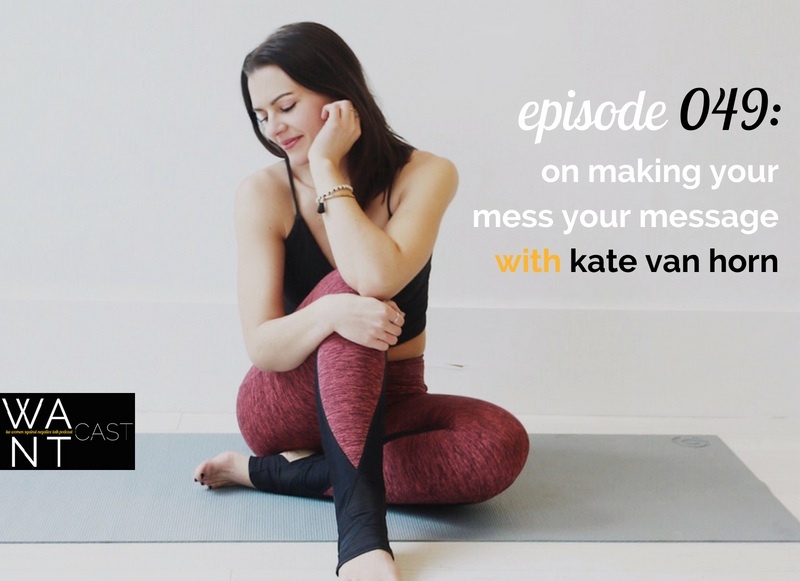 Kate Van Horn is a wellness blogger, yoga instructor and entrepreneur based in Philadelphia. Kate promotes health through mindful living, intuitive movement, food freedom and a body positive message. Kate is the co-founder of a wellness events business, The GOOD Festival, which hosts festivals, retreats and workshops nationally. Kate was recently names 1 of 25 Influential Women to Watch in Wellness by Yogiapproved.com and her story and writing have been featured in mindbodygreen, Yoga Digest and Thoughtfully Magazine. This episode is AMAZING for anyone who wants to build a community of like-minded people sans the BS (whether in-person or online), interested in creating serial success instead of being a one-hit-wonder, loves wellness but is looking for a little more substance than what’s on-trend, is curious as to how wellness practices can ACTUALLY heal past wounds and trauma…and, speaking of trauma, anyone who has either experienced trauma in their past that might be holding them back, or knows someone who is still working through their own trauma and might not even recognize it. So grateful to Kate for sharing so much of herself and being so willing to talk about some sensitive subjects. This is definitely one of my favorite episodes, not just of this season, but of all-time. If you liked this show, make sure to sign up for The (Good) Word, weekly WANT tips, tools, and resources to shift around your negative self talk patterns. Be sure to subscribe in iTunes and leave a five-star review if you’re feeling it, so that iTunes knows to get it into people’s ears AND so that future guests can get excited when I approach them to be on the pod. All that stuff helps the algorythms and goes a long way, plus, I love knowing what you’re enjoying and why, so I can give you more of it! The Recovery Myth: Let’s Get Real. I was really struggling to figure out what to post for #NEDAwarenessweek and its theme, #LetsGetReal, so I figured I would share the realest of the real: me sitting in probably the most cluttered corner of my home on my floor in my ZONE editing a podcast. Yeah, I had tons of body-related pics I was thinking about sharing. But if we’re being real, I’m going to post real. No shade to anyone who has shared a body-related pic…I’m just feeling something different tonight. A big recovery myth is that eating disorders are primarily about your body getting bigger or smaller or wasting away. Not even close. They’re about your PASSIONS wasting away. Ever since I was little, I’d sit on the floor changing positions by the minute and get lost in projects – from drawing to dioramas (there were even the Barbies I dressed up as the entire cast of Les Misérables in costumes that took hours to sew and construct, but that’s another story for another day). Eating disorders steal that zest and passion away from you and convince you the only thing you can and should be good at is fending for yourself so much that you shut the entire world out. Recovery is not just about “getting back” your body, which is why I’m not going to post a pic of my body with a #recovery hashtag this time around. It’s about getting back what makes you YOU. So yeah. Maybe not the most post-able pic. But this is what my recovery looks like: being so immersed in what I love to do that I could really care less about the way anything looks. I am so proud to bring you THE RECOVERY MYTH: a four-part miniseries by WANT sharing real-life stories, smashing open misconceptions, and shining a light on what recovery from an eating/body-related disorder or addiction REALLY looks like. I’m talking to experts, healers, and real-life recoverees answering some of the top recurring questions I’ve gotten from you over the last few years. Not just questions about recovery itself, but about the befores, the durings, the afters, and all the in-betweens that can sometimes seem like you imagined them. To be clear: the point of The Recovery Myth is NOT to prescribe a roadmap or provide a neat-and-tidy picture of what recovery looks like. The point is to dispel myths surrounding recovery and gain multiple perspectives to provide a more inclusive, holistic, and ultimately helpful view of what it looks like to go from the darkness into the light. In Part One, we debunked the seven biggest myths and misunderstandings surrounding recovery (read + listen here). In Part Two, I talked to actor, host, blogger, and activist Lynn Chen all about navigating recovery in the midst of social media pressures, food intolerances, and a #bodypos world that sends mixed messages (listen here). And in Part Three, I spoke with healer and founder of Breathwork For Recovery Nathaniel V. Dust all about processing trauma, rewiring behavioral patterns, toxic relationships, and alternative forms of therapy you might not ever have known existed (listen here). The answers to this question were just as varied as the women who answered it, but every person touched on one common thing: it’s a lot more complex than just a before and after shot. Recovery isn’t so much about getting back to normal as it is about the process of creating a new normal. No one formula works for everyone, and no one path is linear. Recovery isn’t always obvious – because the real healing happens in parts of your head and heart that no one can see. Learning to create a new normal in life also means creating a new normal when it comes to how you deal with discomfort. The hardest part of recovery isn’t necessarily when you’re first learning how to stay away from or replace the behaviors you once had: the hardest part of recovery can be when you think you’re on the right path and then get sneak-attacked by something you didn’t realize was a trigger. That’s why it’s called a trigger – you don’t see it coming and it hits. FAST. The recovery dance can feel like a risky one. Triggers everywhere. And not a lot to trust. But then again, building trust often times feels like the riskiest feeling of all. And just like building trust in a friendship or romance, the biggest risks reap the biggest rewards. To be “recovered,” by society’s standards, insinuates being saved by something or someone. And let me be clear: YOU NEED TO ASK FOR HELP. Call. Text. Reach out. Book the appointment. Have someone book it for you. Just involve others. Humans are community-driven creatures. We need each other, in our highest highs and lowest lows. But no matter how much therapy you go to, treatment you have, or self-help books you read, the only person who can truly save you…is you. Recovery is a choice that comes about with a lot of support, but is spurred into action when you finally say no to your crutches and YES to your capabilities. Recovery is becoming the you YOU know you’re meant to be. To me recovery is self-awareness. It’s having the courage to really examine my [body image & food] thoughts, choices, behaviors and get honest about what the intention behind them is and trying to make the best choice in each moment. For the most part I know what is the most recovered thing to think or do or eat but making that choice again and again each day is where some challenge comes in. I think of recovery as flexible – it ebbs and flows but more and more each day I lean more towards self-awareness and getting honest about the intentions behind my actions. To answer the question of what recovery means to me, it means living my life by a set of principles that were outlined in the Big Book of Alcoholics Anonymous, from living with honesty to making amends to trusting in a higher power. I live by those prinicipals in all areas of my life (my food/body, relationships, work, etc) as though my life depended on it – because it does. What I learned when I attended OA was that I have a physical allergy to certain types of food/behaviors and that once I start eating that food or doing that behavior (purging) it is impossible for me to stop. My body and mind are different from other people who do not suffer with the same allergy. I learned that abstaining from those things will give me great freedom. And the only way to abstain and be free is to work a day at a time on what the true problem is: it’s not food, but rather an inability to cope with life. Food was my solution to my problems and I have since found a new solution: I learned that my illness is never cured but can be arrested on a daily basis if I’m willing to do the work. I have developed a relationship with something outside of myself and I live my life (or try to on a daily basis) to be of service to others. I believe in being honest and looking within myself instead of outside myself at what is wrong with others. I owe my life and everything amazing I have today to the 12 steps. My husband, my family, my job, my changed outlook on life. Through this I have freedom from food obsession, body obsession and can enjoy the deep meaningful things in my life. Recovery means an internal healing. Recovery is an everyday commitment of introspection, acceptance and a willingness to be vulnerable with the unveiling of your true self. Recovery is a choice. Recovery is your opportunity to show up for yourself in a profound and permanent way. How you accept yourself, present yourself, and care for yourself is a blessing and a much sweeter blessing when you are confronted with the negative self talk and comfort of falling back into self-sabotaging habits. Every moment you choose your health and your happiness over your past demons you are living your recovery. Take the wins. Recovery is not just the absence of a thought or behavior. It’s putting together a toolbox that will help you get through each and every day without going absolutely bonkers. Recovery means freedom. I have the freedom to take chances and risks, experience complete bliss as well as struggle and sadness. The freedom to live life in every moment and in every emotion without the need nor the desire to numb out and resort back to the harmful behaviors my eating disorder once had me trapped in. I am free to bravely live my life in all its glorious beauty and strife – no hiding in shame and no apologies for my authenticity. To me, recovery means not having to think about recovery. I got to a point in my recovery when my life was all about recovery — being in it, staying in it, being accountable for it, performing it, etc. I was all about talking about food, posting about nutrition, thinking about my body, reaffirming my body image…it got to the point when I was “so recovered” that my entire identity was recovery. And so I stopped “recovering” — because I was already recovered. And I went out and tried “discovery” instead. I found interests that brought me outside of the kitchen and the gym and off of social media. I continued to be recovered (not falling back into disordered habits, patterns, mindsets, or behaviors), but I just used all of the extra time I got by not thinking about food or my body to go out and do something fun with my life. Everyone’s discovery will look different — because no two people have exactly the same interests — which makes it much harder to be prescriptive about than recovery. But you have to go out and try and not be afraid to fail. There’s no wasted time in discovery, even if the thing you try isn’t something you want to do again. It’s a learning process in which you get to fully come into your own. Now I’d love to hear from you: what does recovery mean to YOU? Let me know by adding your answer to the mix in the comments – because each of us experience recovery differently, and each of us have a lesson to share. I’ll be featuring some of my favorite answers in the final WANTcast episode of The Recovery Myth. Know someone who might need this miniseries? Forward it along and let them know you care. Know someone who might be able to contribute something unique to the conversation in the next round of this miniseries? I’d LOVE to meet them. IF YOU OR SOMEONE YOU KNOW HAS GONE THROUGH AN ED/ADDICTION/SUBSTANCE ABUSE (**AND HAVE SUCCESSFULLY RECOVERED), OR ARE AN EXPERT IN THE FIELD, shoot me an email at katie@womenagainstnegativetalk.com and we can get to talking. I am so proud to bring you THE RECOVERY MYTH: a new four-part miniseries by WANT sharing real-life stories, smashing open misconceptions, and shining a light on what recovery from an eating/body-related disorder or addiction REALLY looks like. I’ll be talking to experts, healers, and real-life recoverees answering some of the top recurring questions I’ve gotten from you over the last few years. Not just questions about recovery itself, but about the befores, the durings, the afters, and all the in-betweens that can sometimes seem like you imagined them. In Part One, we debunked the seven biggest myths and misunderstandings surrounding recovery (read + listen here). In Part Two, I talked to actor, host, blogger, and activist Lynn Chen all about navigating recovery in the midst of social media pressures, food intolerances, and a #bodypos world that sends mixed messages (listen here). Today, I’m diving in and digging DEEP with Nathaniel V. Dust, healer and founder of Breathwork For Recovery. Nathaniel has worked as a professional healer for almost a decade, using the power of a person’s breath as a catalyst for positive changes in clients’ lives. Equipped with an arsenal of techniques – with a special focus on breathwork – Nathaniel has helped thousands of people process trauma, disarm negative thought patterns, and maintain healthy and happy relationships with themselves and loved ones. And while his specialty IS working with treatment centers, it’s not just substance abusers or people with eating disorders who are changed by his work: Nathaniel’s client base ranges from those seeking relief from everyday anxiety to people suffering from severe emotional and physical trauma who are desperate for help. Which is why I truly feel this episode is a MUST-LISTEN for everyone. Nathaniel will BLOW YOUR MIND with his dissection of trauma, his detailed account of his own recovery, and some alternative forms of therapy you might not have ever know existed (one word: HORSES). Also important: we talk about how to be acutely aware of your recovery journey, if and when and HOW you can help others who are stuggling if you are still in the thick of it, and AFFORDABLE ways to get help yourself. Because treatment is freaking expensive. If you’ve ever felt unsettled trauma in your body…if you’ve ever wondered if there was another way to heal…if you have ever been in a toxic relationship or known someone who has…then this is the episode you’re meant to hear today. Like this episode? Shoot me a comment below, leave a review on iTunes, share it on Facebook, tweet it out on Twitter, or post it on Instagram. Be sure to use the hashtags #WANTcast, #womenagainstnegativetalk, and/or #WANTyourself! Know someone who might be able to contribute something unique to the conversation? I’d LOVE to meet them. IF YOU OR SOMEONE YOU KNOW HAS GONE THROUGH AN ED/ADDICTION/SUBSTANCE ABUSE (**AND HAVE SUCCESSFULLY RECOVERED), OR ARE AN EXPERT IN THE FIELD, shoot me an email at katie@womenagainstnegativetalk.com and we can get to talking.